Garden goodness is one of the reasons I haven't been posting much this week! 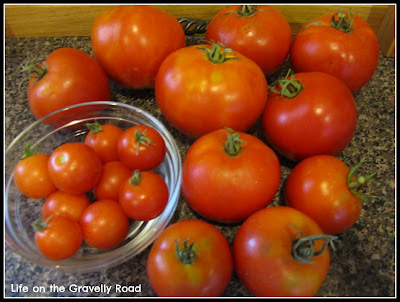 Its so fun to be able to start harvesting fresh veggies from the garden. Tomatoes are ripening fast, the first green pepper is ready with more coming soon, the first of many cucumbers, more zucchini and the list goes on. Then of course you have to do something with all the goodness. I made black bean and corn salsa earlier this week. Tonight we had a wonderful basil pasta dish with cheesy broiled tomatoes. I also see a few more BLT meals in our future :) I used up the first two zucchini making bread last weekend (and gave a loaf to my neighbor for all her green bean generosity). On Monday she brought another batch of green beans (think plastic grocery bag filled to overflowing). So I'd been working on freezing those. Then yesterday morning she stopped by with a bag of already husked sweet corn. Apparently a friend brought her way too much and so of course she shared with us. We had sweet corn for lunch and I froze the rest that afternoon. I love that our freezer is starting to fill up and we've had so many fresh foods to eat. What a blessing! This mama loves garden goodness too. My garden is so small though because we live in the city with a tiny yard. So we just eat what we grow...there isn't enough to freeze. Laura - any size garden is a blessing! This is our first year with more than a container garden. Glad you have some space for a garden and enjoying the yummy results. Thanks for stopping by. I'm interested in how you froze the green beans..and also the recipe for black bean and corn salsa; that sounds yummy!! I just started my first ever container garden and I love It!! The salsa recipe can be a lot unless you have lots of salsa eaters in your house.... I usually make half since its just my husband and I who eat it. Fun with the Letter "P"
Fun with the Letter "F"
Fun with the Letter "O"
Fun with the letter "D"